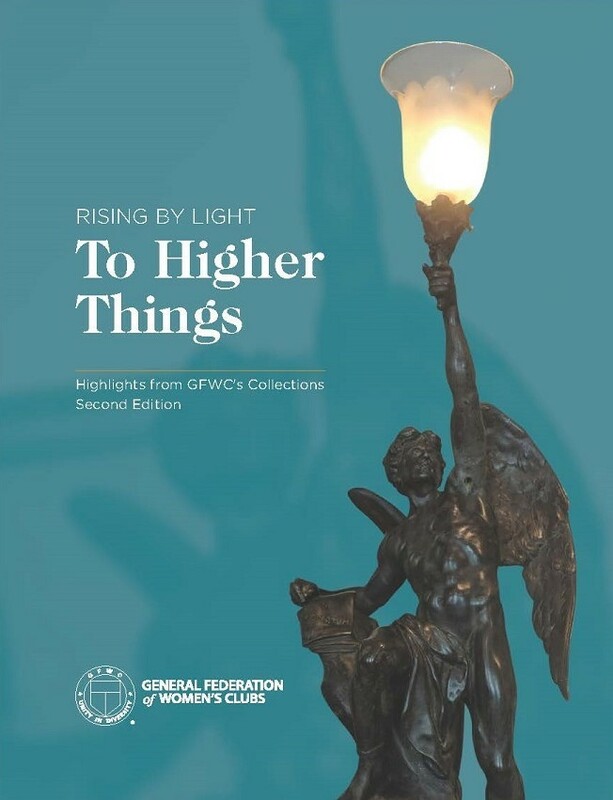 Since day one, GFWC has advocated for peace and peacemaking solutions. Founded at a time when the Civil War was still alive in the memory of many of our clubs, clubwomen were active in organizing peace rallies and writing editorials on the importance of peacekeeping efforts. GFWC even participated in forming organizations like the United Nations, which seek to maintain a peaceful order. Our commitment to peace has always been accompanied by strongly supporting our military and their work during both times of war and times of peace. Although women were not admitted into combat until recently, they have always been part of the American military story- and an integral part in its success since its founding. GFWC is part of that story. During both World Wars, GFWC engaged in numerous activities for the war effort on the home front. However, we also trained nurses and overseas units to aid in battle. During WWI, GFWC, under the direction of the YMCA, formed its own overseas unit. Although 100 girls were accepted into the program, fighting ceased before the girls were able to depart. The unit still shipped out in early 1919 to aid the troops which were still stationed overseas. Women were stationed throughout France, Belgium, and Germany where they performed rolling canteen duties and aided the troops within their recreation areas. GFWC continued to assist the Red Cross and train nurses throughout both World Wars, the Korean and the Vietnam Wars. GFWC can also lay claim to prominent clubwomen, such as Margaret Chase Smith, who advocated for women in the military. Smith was an advocate and a sponsor for the Women’s Armed Forced Integration Act and pushed for equal treatment of women in the military. In 1943, Smith was appointed to the House Naval Affairs Committee and made a 25,000-mile tour of bases in the South Pacific, she became the first and only civilian woman to sail on a U.S. Navy Ship during WWII. In 1950, Smith was commissioned as a Lieutenant Colonel in the Air Force Re-serve and served in that post until 1958. In the 1990s, GFWC joined fundraising efforts for the Women in Military Service for America Memorial, and was present at its groundbreaking in 1995. We continue to provide support for this incredibly important memorial and the valuable work that it does. Today, we maintain our support for women in the military through our Seven Grand Initiatives. 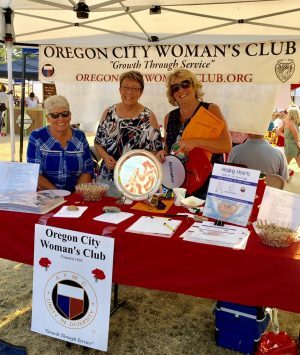 One of our major initiatives ensures that clubwomen continue to show their appreciation of active female military members and veterans alike. 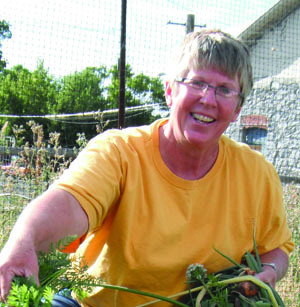 As evidenced by the following articles, this work has been and continues to be a major foundation of clubwomen’s efforts within our communities. We are grateful for all that you do to support our female soldiers and veterans, and even more grateful for the support and freedoms that they provide us. “Throws of Love” began as a one-time project to make 100 fleece throws for the Wounded Warriors Battalion stationed at Camp Lejeune, North Carolina in April 2007. The successful project was quickly followed up with a box full of throws to the 31 Honor Guard soldiers who accompanied Col. James Ayres, USAF MIA, home to Pampa, Texas after 37 years missing. Furthering the project, Texas clubwoman Nelda Laney sent newspaper articles to then-President George W. Bush which detailed the efforts of the clubwomen. As a result of Nelda’s efforts, Past District Texas President Donna Hogue and Col. Ayres’s widow were invited to the White House for the lighting of the National Christmas Tree and a Christmas party 2007. Clubwoman Donna Hogue continues Throws of Love as an official club project in memory of her husband, 1st Lt. Robert E Malone, who gave his life in Vietnam in April of 1968. Malone trained as an armor tank driver in Ft. Knox, Kentucky. He commanded as 1st Armor at Fort Bliss and 9th Infantry in Vietnam, and sadly left Hogue a Gold Star wife. 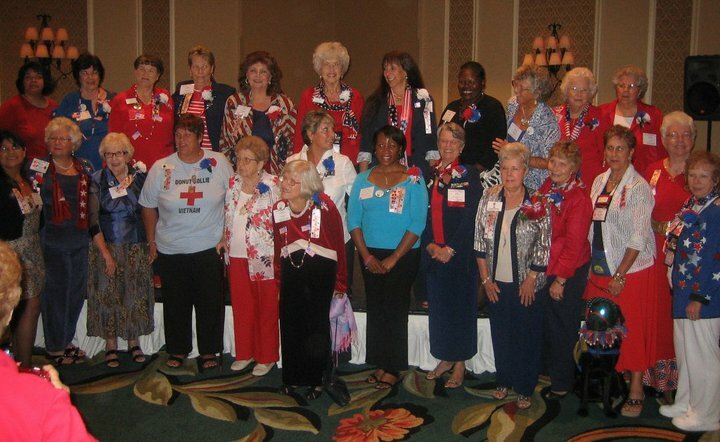 In 2010, GFWC Florida chose “Salute to Veterans” as the theme for Florida’s Fall Board Meeting. GFWC clubwomen from all over the state who had served, or were currently serving, in the military were honored. All weekend red, white, and blue were proudly displayed from decorations, to dress, to accessories. Saturday evening’s dinner program focused on female veterans, and the evening started with a special President’s Reception for all the veterans attending. The reception gave the women an opportunity to meet the president, the Executive Committee, and each other. This reception was followed by a veteran procession into the main ballroom where fellow clubwomen cheered them on. Colonel George “Bud” Day, a WWII, Korean War, and Vietnam War veteran, gave a moving speech during the dinner. Colonel Day spent five years and seven months as a POW in North Vietnam and was a Medal of Honor recipient. On 8 June 2018, Colonel Day was posthumously promoted to Brigadier General. His wife and clubwoman Mrs. Doris Day also spoke at one of the workshops. Entertainment for the dinner banquet was a USO-style show with “Judy Garland,” “Bob Hope,” the “Andrews Sisters,” and “Ella Fitzgerald” providing musical renditions and jokes. GFWC Florida club members that were honored served in all the branches of the military. There were three veterans of WWII, as well as others who served in Korea, Vietnam, the Gulf War, Iraq, and Afghanistan in attendance. There was also a “Donut Dolly” present, who went to Vietnam as part of the Red Cross’ Supplemental Recreation Activities Overseas program to boost the morale of the troops. It was a wonderful weekend which the clubwomen, and those who were honored, will treasure. GFWC Arizona hosted a Bob Hope USO tribute at their Convention this past April. Each district was asked to provide a lip sync song which was then performed. The evening began with the GFWC Arizona Executive Committee performing a rousing rendition of “Boogie Woogie Bugle Boy of Company C.” EC members strummed their guitars and tooted their trumpets along to the 1940s hit! Special guests “Tina Turner” and “ABBA” also performed their greatest hits for the enthusiastic crowd. Despite the wonderful performances, watching the clubwomen dance like Tina, move like ABBA, and sing like the Andrews Sisters provided the best entertainment. Following the performances, clubwomen took part in a USO Trivia Quiz. Attendees also had the honor of being joined by the Arizona Director of the USO for the evening. The Director gave a detailed history of the USO and invited the Arizona Federation to take a tour of the USO Center at the Phoenix Airport. Fun and games aside, all Convention attendees were asked to bring baby items such as diapers, bottles, and onesies. 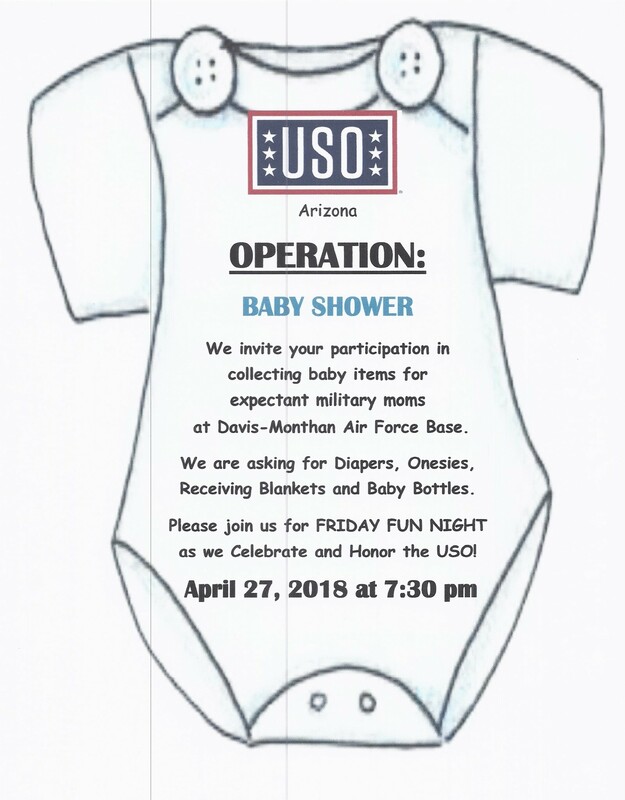 The items were donated to Davis-Monthan Air Force Base. Clubwomen also made no-sew blankets to donate. In-Kind donations from the Conventions totaled $4,300.